Anyone who believes writing is a solitary pursuit is obviously not a member of RWA. In the short amount of time I've been a member of RWA and my local chapter, MCRW, I've met some amazing people. People who are frank and funny and honest. People who encourage you through the first draft, push you out of your comfort zone, and make you laugh after a contest judge questions your understanding of the English language. People who support one another, in writing and life. People like CJ Redwine. The next day, we began researching adoption and we picked out her name: Johanna Faith. Johanna means God's Gracious Gift and Faith is what it is taking to bring her home. We signed up with Chinese Children Adoption International agency based out of Colorado. We completed our stateside paperwork and homestudy within a few months, sent off our dossier to China with the understanding that it would be a 6-8 month wait, and eagerly planned to bring our daughter home. Soon, though, we began to hear rumors that the wait time was extending. Then we heard that the government had cracked down on orphanages who were receiving money from the state but who weren't keeping all of their beds full and the wait slowed to a crawl. Our dreams of having her home for Christmas were dashed. And then our dreams for having her home in time for summer were dashed as well. Before we knew it, another Christmas had passed and we were still waiting. Meanwhile, the Olympics were coming to Beijing, and the word was most adoption processes would stop altogether. As the wait stretched from 8 months to three years, I struggled with depression. I could hardly bear Christmas, because she wasn't yet there. I shut the door of her bedroom and left it closed because I couldn't bear to walk past it in the hall. It hurt to think about having a child out there whom I couldn't protect. Couldn't love. Couldn't save. Three years became four with no real change. Our homestudy expired. Our immigration petition expired. Three times. Our fingerprints expired. Four times. And China raised the orphanage and court fees by thousands while we waited. Suddenly, the cushion of money we'd raised at the start of this process was almost gone, and China was picking up speed in their child match program. In September, it will be five years since we officially started our adoption process to bring Johanna home. We expect to receive her picture, information, and permission to travel sometime by the middle of September. I opened her bedroom door for the first time in 3 1/2 years. And went a little crazy ordering cute little hand-made hats and headbands on Etsy because I still don't know her size so can't buy her any clothes. We're so excited to be able to travel soon to bring her home! But we still need to raise $8,000 to ransom her life from the orphanage. And that's where you come in! It's time to unite Johanna Faith with her family, and here's how you can help. See the pretty pink and brown button? Click it. 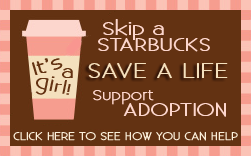 Click it and donate what you'd spend on a cup of coffee (or two...or three) to bringing a little girl home to the family who loves her and has been waiting years just to meet her. Generosity may be its own reward when dealing with those less awesome than the Redwine's, but CJ has found a way to make donating to a fabulous and worthwhile cause beneficial for you. Seriously, how amazing is she? In addition to good karma and self satisfaction, you can win prizes. Many prizes. Serious prizes. Just for helping out and donating to a good cause. That's pretty freaking sweet, if you ask me. And CJ's not the only one offering prizes on her blog. A whole host of bloggers have joined in to help bring Johanna Faith home. Make a donation to Johanna Faith's fund, and you can enter to win prize packs of vampires, pirates or wizards (oh my!). No matter what your interest, there's something that will catch your eye. Make a donation at CJ's blog, then leave a comment on this blog. Get the word out about Johanna's journey. Tweet, blog, or facebook the link to CJ's post before 11 pm CST on Wednesday, August 25, then leave a comment on this blog with the link. Want to enter multiple times? Donate and blog. Blog and Tweet. Facebook and donate. Mix and match, just leave a comment letting me know what you've been doing to help bring Johanna Faith home. 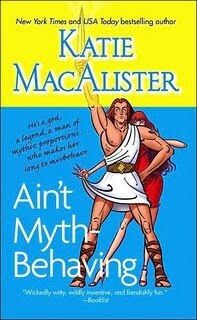 The winner will receive paperback copies of Katie MacAlister's Ain't Myth-Behaving, and the Over the Moon anthology, featuring stories by Angela Knight, MaryJanice Davidson, Virginia Kantra, and Sunny. Yay! Thanks for joining in on this! I donated and tweeted (I don't know how to do a direct link, but I copied @cjredwine and #skipstarbucksday from my @jamigold account). I donated and tweeted, and I added a post on my blog at http://bit.ly/bqXm5P where I also to send a signed copy of the Silver Moon, Bloody Bullets anthology (I am one of the authors) to anyone who donates more than $25 (the amount I gave). Come on over and show me up, and I'll send you an excellent werewolf anthology. I donated, blogged, and posted on FB. I donated. Such a great cause! You all are so awesome! Thank you for participating and donating to help bring the Redwine's little girl home! In one hour I'll tally up how many entries each commentor has, run those through the ole random number generator, and send the winning name off to CJ for verification. I should be able to announce the winner sometime tomorrow. Thanks for supporting CJ and encouraging us to do the same! The contest is now CLOSED. Thank you so much to everyone who donated and encouraged others to do the same. You are all awesome!! I've tallied up all the enteries and I have a winning name. I need to run it past CJ and her donors list, but as soon as I have confirmation I will post here. Thanks again for your outpouring of support! !